This Parmesan Crusted Chicken is a simple and delicious recipe to add to your chicken repertoire! 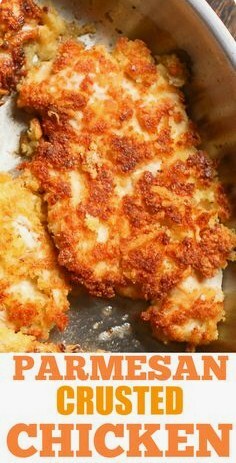 In this easy chicken recipe, thin chicken breasts are are coated in Parmesan, egg, and bread crumbs, and pan fried until crispy! Kids love it and so do the adults. TO MAKE BREADING MIXTURE: In a shallow dish mix ½ cup Parmesan cheese, 1 cup bread crumbs, 1/3 cup flour, ½ tsp salt and 2 tsp Italian Seasoning and set aside. Add 2 eggs into another dish or a bowl and whisk them until mixed. MAKE SURE TO USE THIN CHICKEN BREASTS: If your chicken breasts are not thin, butterfly them, or flatten them by pounding with a meat tenderizer. The thinner the chicken breasts the better. DIPPING CHICKEN INTO THE BATTER: Take a chicken and dip in breading mixture first, then into the egg bowl, then back into the breading mixture. Shake off the excess each time to prevent the breading from falling off later. I went from one bowl to the other until I liked how much stuff I had on the chicken. Repeat with each chicken breast and set them aside on a plate. PAN FRYING CHICKEN: Heat olive oil on medium high in the stainless steel skillet and cook on medium high for 3 to 4 minutes on each side (total of 6-8 minutes) – just set the timer and flip when it beeps. Check to make sure the chicken is fully cooked an not pink. If not, lower the heat and cook for a couple more minutes. 0 Response to "Parmesan Crusted Chicken"